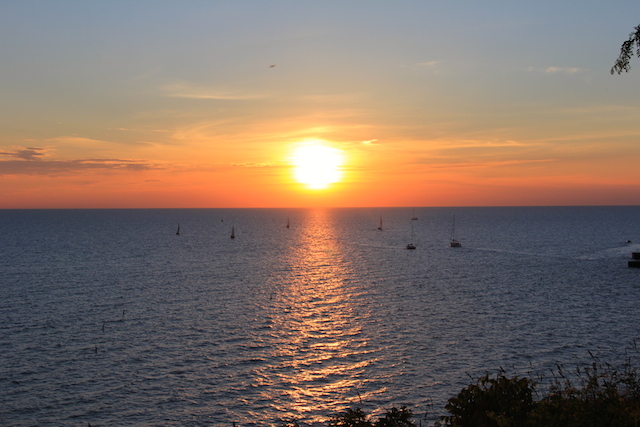 There is no doubt that this is shaping up to be an excellent summer. Just a few days after our camping trip I was headed back up to the shores of Lake Huron (though not so far north as Georgian Bay) for a cottage weekend. An old friend of mine is getting married and in lieu of a bar hopping bachelorette we spent a weekend away (and on the beach). The weather was perfect, and the water is warm enough for swimming, and it was gorgeous. I knit in the car on the way there, which ended up being hilarious in the stop-and-go traffic since a guy in the lane next to us was fascinated by what I was doing. He stared and, when his lane got moving, actually slowed down so we could catch up! He seemed completely entertained by the idea of someone knitting (or, at least the idea of someone his own age knitting). His amusement entertained us as well, which made for a pretty funny drive. 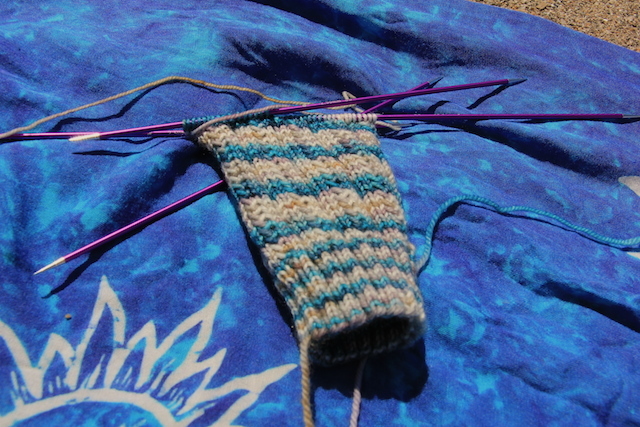 I snuck in a little beach knitting too, and my Summer Skyp socks are coming along nicely. I’m staying home this weekend, but I’m looking forward to turning my attention to Halligarth, which is proving to be a very enjoyable knit, especially when accompanied by a podcast or audiobook. A while ago, I did a post about all of my works-in-progress. In truth, nothing much has changed with most of them, but the act of getting them all out so I could take fresh photos sparked a renewed desire to see them finished. 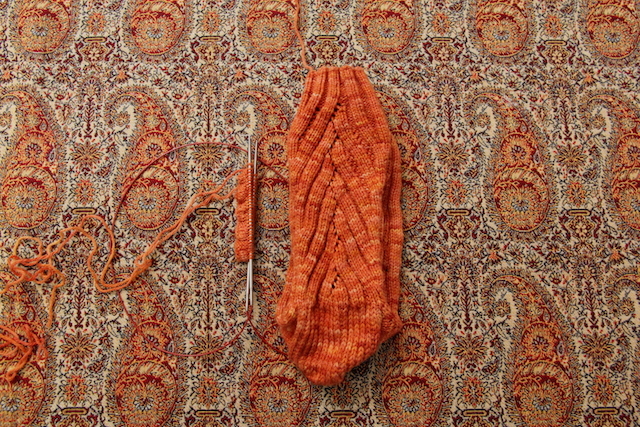 I have since picked Grace back up and, to my deep satisfaction, finished the longest-standing WIP in the pile, Shaelyn. I’m not sure what L was doing with the camera here, but I was definitely standing upright. I cast this on over a year ago, and it is a prime example of a project being the victim of its circumstances. Mainly, that the yarn I used (Handmaiden Casbah in Lupins) was awful to wind. Both skeins had switchbacks that required cutting the yarn and untangling it on the swift. 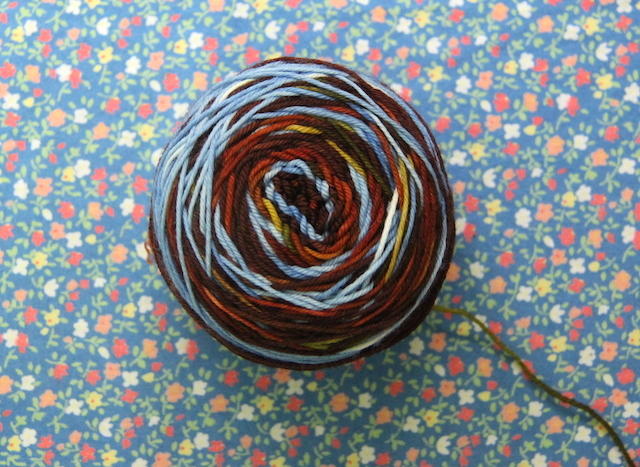 I think I ended up winding the skeins by hand (each one in two halves) before re-winding them into cakes. 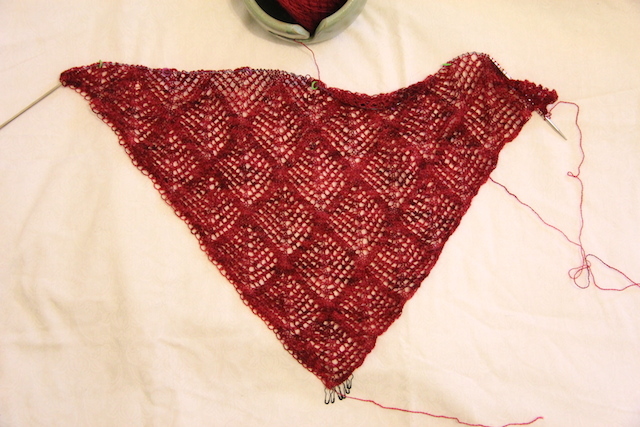 I probably shouldn’t have cast on right away, because I was ticked off, which made it really easy for me to put down this shawl at the first moment it became less than intuitive (by which I mean, my stitch count was off and I couldn’t be bothered to figure out why). We’ve all had these projects, right? 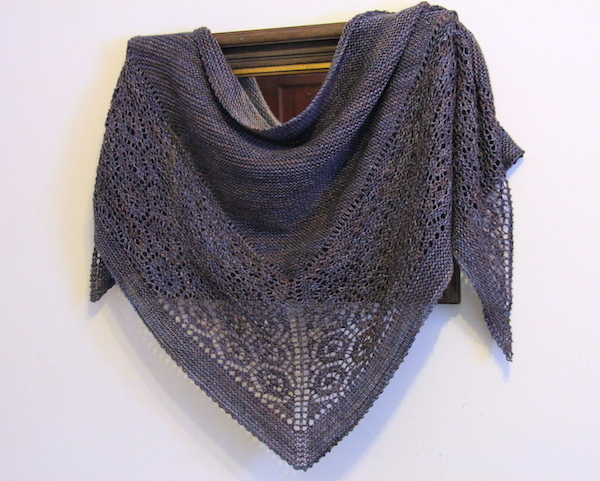 Anyway, after I finished Flukra and found myself wearing it pretty much every day, I decided I wanted another big shawl immediately. I could have cast on for something new, but Shaelyn was three repeats in, so figuring out where I went wrong seemed faster — and since Leila Raabe offers a little guide to figuring out where you are in the pattern, it only required me to rip out a couple of rows to get back on track. I knit on Shaelyn steadily before putting it down to start New Girl, and then last weekend I decided to finish it. 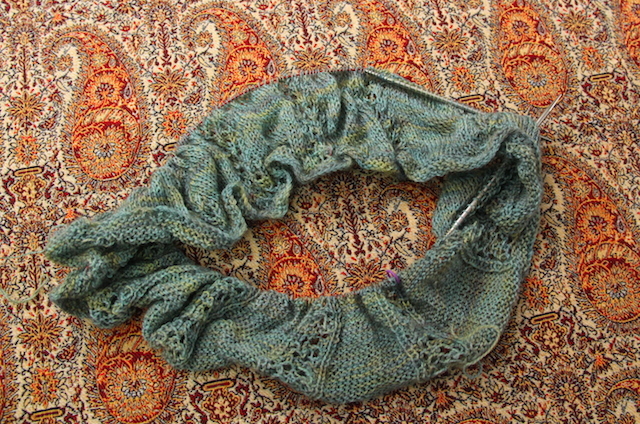 I was nearly finished the seventh repeat when I put it down (I wanted a big shawl, after all) and the remainder of the repeat, plus the edging and the bind-off took most of Saturday (the rows were all 300+ stitches), but it blocked out beautifully and dried over night, in time to take pictures of it with New Girl. 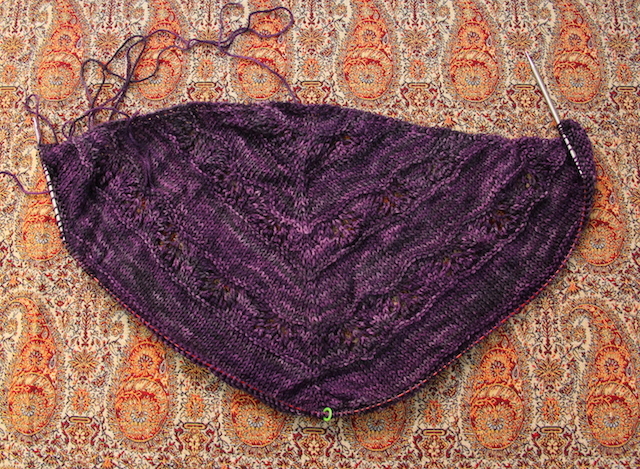 I really wish I’d measured it before blocking (we had friends over, so after finishing the cast-off over drinks, I just put it in to soak), but I’d guess it blocked out 12 inches are so larger in both wingspan and depth. It’s huge, but the loose and drapey fabric make it light and easy to wear, and it needs no adjusting to stay put around my neck. 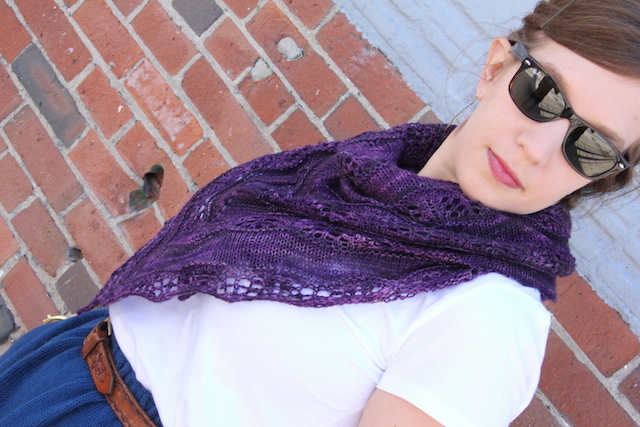 I love it, and I am so glad that I both waited so long to finish it (I was annoyed with it originally, so might not have pushed ahead with the extra repeats) and that I picked it back when I did — it’s perfect for spring! Finished measurements: 66 inches across x 36 inches deep. Enormous. Notes: I had two skeins of the yarn, so I added two extra repeats of the chart before the edging. With one skein I would have been fine to have knit this as written (the extra two repeats + edging took about half the second skein). 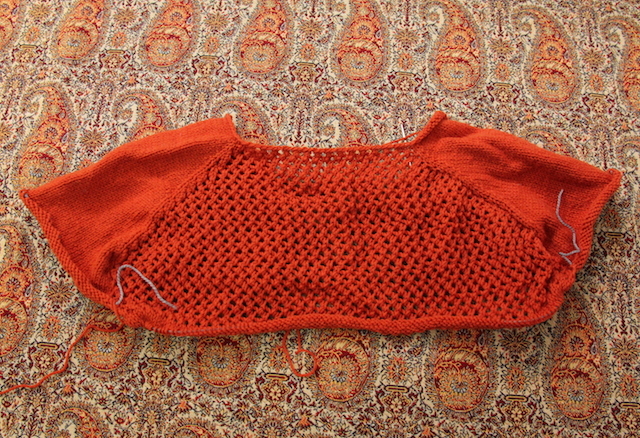 I used Jeny’s Surprisingly Stretchy Bind-Off, which gives a nice edge especially for blocking out the slightly-scalloped edge. Ravelled here. Flukra is amazing. I’ve worn it nearly everyday since I finished it and I am not even close to tired of it yet. 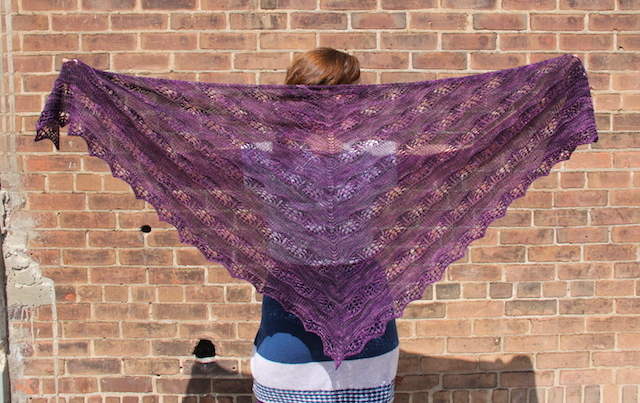 There are a lot of reasons I love this shawl, but certainly one of them is the size. It blocked out to 63 inches wide and 23 inches deep, which may be just about the perfect size. I tend to wear shawls kerchief-style, and I like it when I can drape a shawl around my neck and know it isn’t going to need constant adjusting to both stay on and look nice. Flukra is perfect n both counts, though I don’t yet have any photos of my wearing it, so you’ll have to just take my word for it. The yarn I used is also new to me and it is heavenly. I find I’m often drawn to one yarn or another because of the colours, rather than the fibre content, but this yarn (Sweet Fiber Cashmerino Luxe) is probably the first really luxurious yarn I’ve ever knit with, and it’s making me want more. The cashmere bloomed every so slightly when I blocked the shawl, and the silk gives the colours a very subtle shine, which combined with the structure of the merino is a pretty delicious combination. When I was originally thinking about knitting Flukra, this wasn’t the kind of colour I had in mind, but now I’m so glad I went this route. This colourway somehow manages to go with everything. 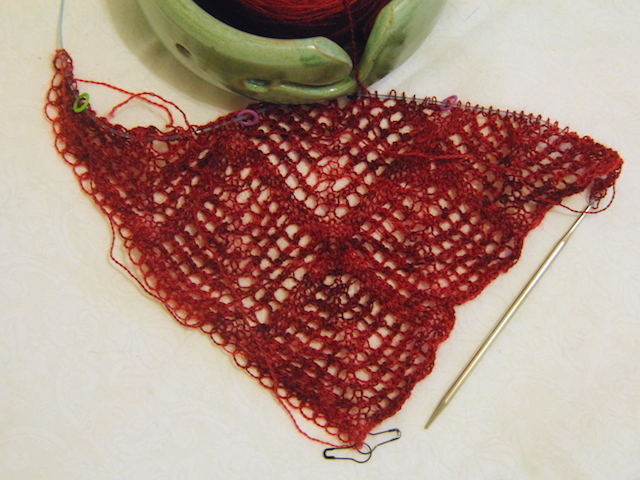 Notes: Like many others, I chose to knit a garter border instead of the lace edging, which worked well with the heavier yarn (the pattern is written for laceweight). 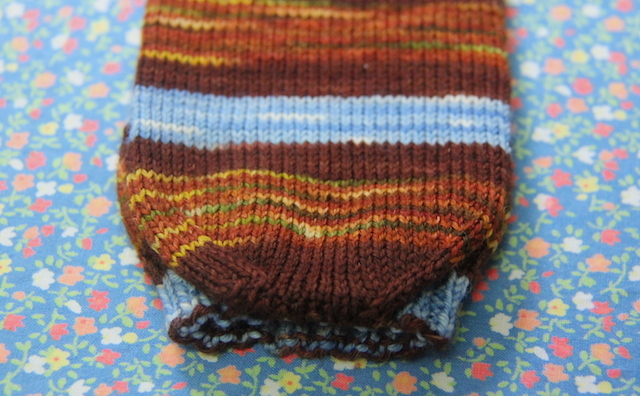 I continued the increases in the edging, but used kfb instead of yarn-overs. And that’s pretty much it. I increased the body to the specified size and did everything else as written. Ravelled here. 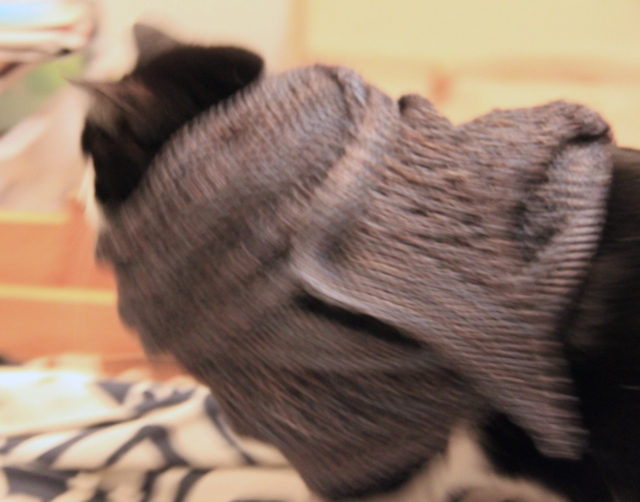 L thinks it’s very funny to “dress” Ganymede in shawls/scarves and see what she does. I was laughing so hard at the put-upon expression she was making I couldn’t hold the camera steady, but doesn’t she look cozy? Ps. Cassy and I are starting our New Girl KAL on Friday! Want to join us? My background knitting. 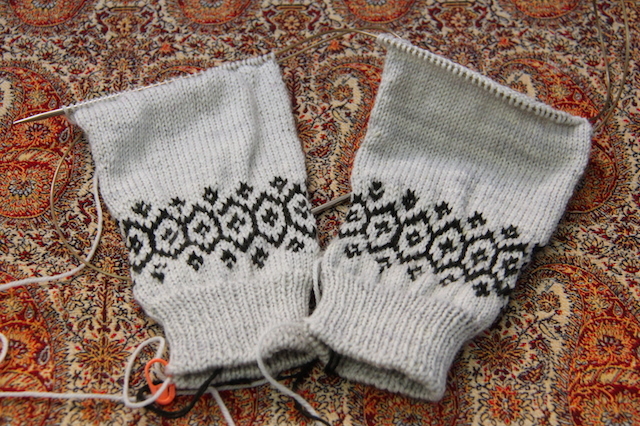 Slow but steady, these are part of my grand plan for increasing my pairs of plain socks. All evidence to the contrary, I know, but it’s true: Just because I’m not actively working on a project doesn’t mean I’m not thinking about it. And, more often than not, I’m debating when/if I should pull it out of my basket and get back to work. I finished my Flukra on Tuesday (proper photos to come) and since I plan to cast on New Girl in the near future, I thought maybe instead of starting something new I’d pick up something that had been languishing. 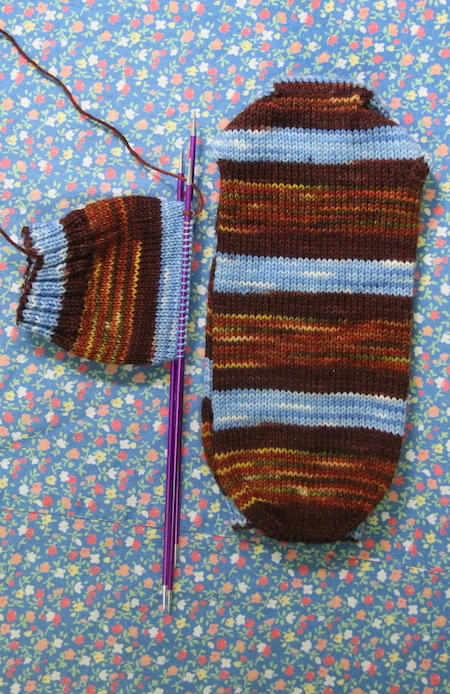 I’m not quite sure what that will be, other than the socks at the top of this post, which have been background knitting for two months now and thus, despite their slow progress, always in active rotation. It occurred to me that some of these projects had never made it onto the blog, or that even if they had, possibly not for a year or more, so here we go, a tour through my works-in-progress (presented approximately in chronological order by cast-on, according to my Ravelry notes). Shaelyn, cast on March 3, 2013. Shaelyn has definitely been on the needles forever. I cast this on when L and I went to Eleuthra last year, and then spent the week knitting socks instead. I did work on this on the flight home, but we fit turbulence and my ruler (marking the row I was on in the chart) was jostled. I lost my place, couldn’t figure out where I was, and put the project away without trying very hard to sort things out. I may also have been frustrated by how awful this yarn was to wind (both skeins doubled back on themselves in the middle, meaning they required cutting, untangling, and rewinding). 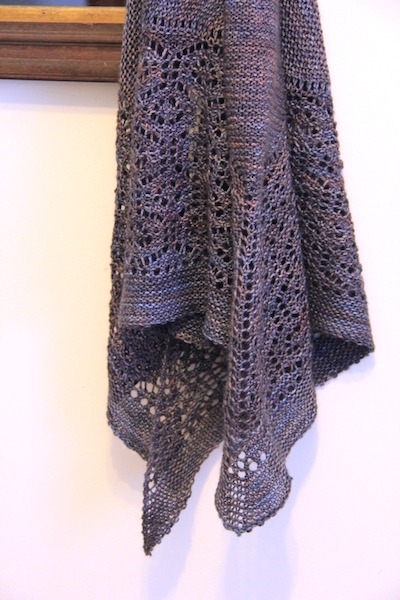 Anyway, now that I have snuggly Flukra to wear I’m dying for another equally scrumptious shawl, and this may be it. There is no excuse for my languishing Hunter St. Cowl except that I cast it on during the same period as most of these WIPs, so it may have been the victim of my restless spirit and a spate of startitis. 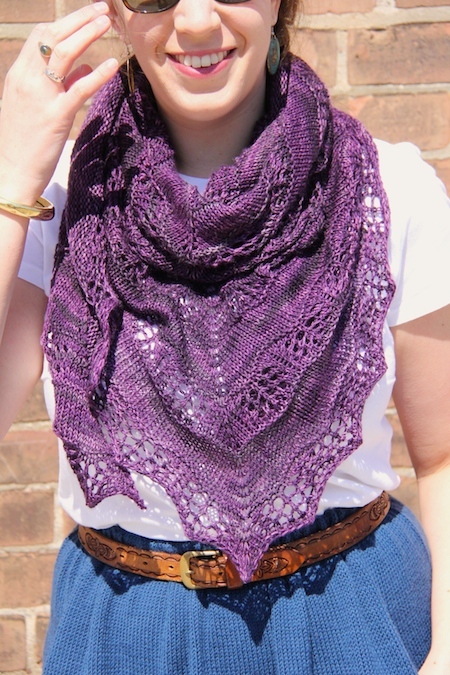 I love this pattern, I love this yarn (Tanis Fiber Arts Pink Label lace weight in Lucky Penny), and even though I’m not really a cowl person, I sense this is one I would wear. Progress was slow at the beginning, and I guess I was in the mood for some quick gratification, so I cast this aside. I would like to wear it this spring though. Grace, cast on June 1, 2013. Not finishing Grace is my No. 1 knitting regret of last year. I cast it on a little too close to summer, I think, and put it down in favour of Kit, and then never quite got around to finishing it. I always forget that fall is pretty much all holiday knitting, which means that great lightweight cardigans that I’d wear all winter basically need to be knit before the end of September. I might not pick this up before New Girl, but I think it’ll be the first thing I knit afterwards – I hope I left myself a good note about where I was in the pattern. 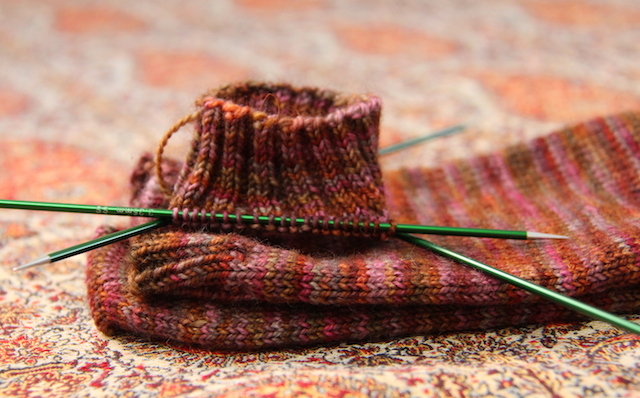 The minute it gets warm, I’m knocking out this second Daphne sock. This is less second-sock syndrome than putting down a for-me knit to pick up a gift-knit, and then not quite getting back to it. 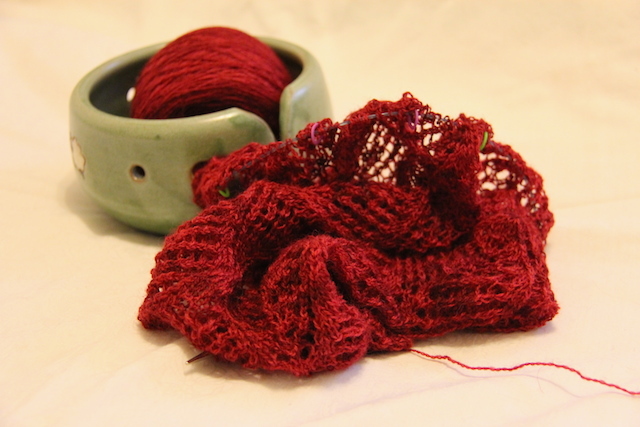 That being said, the first sock flew off my needles (having knit the pattern before made it easy to return to), so I know these will be quick to turnaround when the weather improves (wool/silk/bamboo blend yarn in openwork just isn’t robust enough for winter). Stasis is a pretty recent WIP. I cast on the week before the Olympics, but it’s true what they say about knitting white/grey yarn in February. I got through the colourwork without incident, but the minute I got into the fields of stockinette I just couldn’t handle it. This is a shade I love to wear in the winter, but one I apparently can’t knit with. I’ll pick this back up in May (before it’s too hot to have a sweater in my lap) and finish it so it’s ready for me in the fall. And I think that’s it! What do you think? Are you shocked I have any needles left for new projects or are you laughing that I think this is a lot of WIPs?